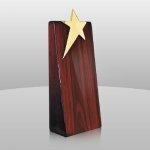 The Celebration award is a clear acrylic piece that features metallic gold faceted edges giving this award a vintage art deco appearance. The piece is attached to a piano finished rosewood base. Perfect for any recognition or award ceremony, including sports, corporate or educational applications. 10" x 7-1/2" x 2-1/2"
This is our standard circle award. It is part of our Classic Collection. This is a circular beveled piece of acrylic attached to an acrylic base. Perfect for any recognition or award ceremony, including sports, corporate or educational applications. 6" x 5-1/4" x 2"
7" x 6-1/4" x 2"
8" x 7-1/4" x 2"
A faceted piece of acrylic that slides into a piano finished rosewood stand. Assembled by sliding the acrylic piece in the slots on the wood stand. Front and reverse laser engraving ready. Perfect for any recognition or award ceremony, including sports, corporate or educational applications. 7" x 9" x 3"
8" x 9" x 3"
A faceted acrylic diamond that sits on a piano finished rosewood stand. The diamond can also be displayed vertically or horizontally. Front and reverse laser engraving ready. Perfect for any recognition or award ceremony, including sports, corporate or educational applications. A clear acrylic zenith award, mounted on a piano finished rosewood base. Front and reverse laser engraving ready, color printing also available. Perfect for any recognition or award ceremony, including sports, corporate or educational applications. The Clear Victory Award is part of our Modern Section and is one of our newer, more cost effective pieces. The clear acrylic faceted piece is attached to a chrome metal base. Perfect for any recognition or award ceremony, including sports, corporate or educational applications. The Clear Victory Award is part of our Modern Section and is one of our newer, more cost effective pieces. The clear acrylic faceted piece is attached to a chrome metal base. It also has a metal star on top that is attached using UV glue. This piece also comes with a chrome metal star that is attached using UV glue. Perfect for any recognition or award ceremony, including sports, corporate or educational applications. 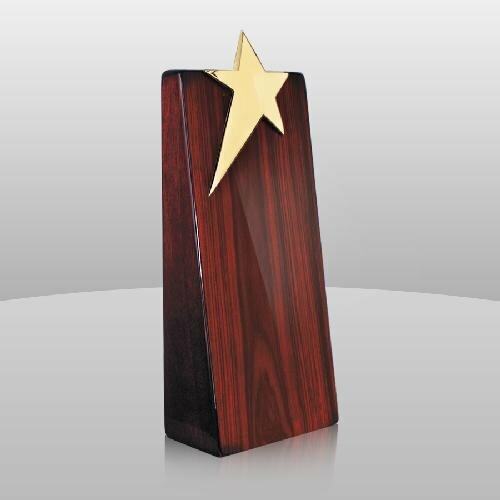 The Constellation Crystal Award is a piano finished rosewood wedge award with a gold metal star. The engraving on the front face of the piece can be either color filled or put on a gold or silver plate. This item currently comes in only one size. Perfect for any recognition or award ceremony, including sports, corporate or educational applications. Clear acrylic rectangle award with cracked ice-like edges on acrylic base. This piece is attached to an acrylic base and can be mounted vertically or horizontally. Perfect for any recognition or award ceremony, including sports, corporate or educational applications. 5-3/4" x 5" x 2"
7" x 6" x 2"
8-1/4" x 7" x 2"
The Curvature Award is one of the newer items in our Solitaire Collection. This freestanding clear piece of acrylic feature a curved front face. This item is currently offered in two sizes. 7" x 5" x 1"